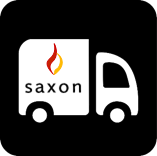 Saxon offer free delivery on our own transport for Range cookers, Fireplaces and Stoves; to the following postcodes, LL, CH, CW, WA, SY and TF (within a 50 mile radius of our showroom). If you live outside of our delivery area, please contact us, we will do our best to assist you. Collection from our warehouse is also available Monday to Friday – Weekends are available by appointment.